I have a number of interests I would like to tell you about. Some of them over-lap and interconnect. For example - my interests are reflected in the subjects of my books, and talks, and my interests are reflected in the way I spend my time. I have not arranged them in any particular order. My interests . . . I think I was born with an interest in railways and in model railways although there was no family tradition which might explain this. I am well aware that such an interest seems “nerdish” to outsiders but that is something that we “anoraks” have learnt to live with. I was lucky in that several important guides helped nurture my interest - one was Jack Nelson who invited me to be secretary of the Ilford Junior Railway Club when I entered my teens. The other was Francis Ashley - a remarkable man who eventually bequeathed me his Gauge Two trains, all built before the First World War. I particularly became interested in rather off beat aspects of the railway world - such as narrow gauge railways and light railways - this has had all sorts of effects on how life has unfolded. Modelling railways has always been important to me, in a variety of scales and gauges. It also led to other specialisms like an interest in constructing models of buildings and street scenes. Eventually all this led to a desire to exhibit models and the pleasures of the exhibition circuit. Exhibits have ranged from a 1” to the foot model of a Black Country high street to a scene based on a railway crossing the frontier between Northern Ireland and the Republic (“Rossinver”). I also exhibited a rural British light railway called “Shellsey”, and a Patagonian terminus called “Trevelyn”. At various times I have tried to show Francis Ashley’s trains to the public but not quite in the ambitious manner he had planned when he designed the “Smoghampton & Greenhills Railway”. I currently have lots of plans for future projects. I have been interested in cinemas and films since going to the Saturday Morning Children’s Matinees at the Odeon, Gants Hill, at the beginning of the 1950s. Once again I have been lucky in encountering lots of people to nurture this interest. At school (Wanstead High School) we had a wonderful film society and a year or so later a local cinema closed (The “State”, Leytonstone) and I was among the enthusiasts who joined the co-operative that took it over and ran it. Eventually we only showed films on Wednesday nights, but by then I had found other London cinemas that showed interesting films. A man named Stanley Reed lived close to the school and he was secretary of the British Film Institute and champion of the National Film Theatre. I was able continue my interest in films and film societies when I came to Dudley in 1962, and later in Wolverhampton. I have spent many an evening sandwiched between two 16mm cine projectors, and have sometimes thought that film can be as serious an addiction as trains! While in the sixth form at school I joined a group in making an 8mm film called “Breathless” with little resemblance to the Godard film of the same time and name. That was the start of an interest in film-making and when I came to Dudley in 1962 this interest began to flourish. Together with Michael Ball and Roger Crombleholme, I established Uralia Films and for ten years we were very active in the amateur film-making world. The technical and financial challenges were enormous but today’s technology makes them seem ridiculous. We were obsessed with the problems of paying for film-making, and the desire to exploit synchronised sound. Today’s DVD makers face no such problems. Some of the Uralia Film output has been put on modern DVD and I am still interested in the prospect that yesterday’s 8mm film-makers may have captured some images of the past that we would now find very interesting. After writing the book “Black Country Cinemas” - published way back in 1982 - I started to receive messages from people connected to the fairground world because some of the cinemas I had described once belonged to a famous local showman named Pat Collins. This was a classic case of “one thing leading to another”, and by the end of the 1980s I was absorbed by the task of writing a biography of Pat Collins. This started out as a project undertaken jointly with the late Freda Allen and I think the project changed both our lives. I can remember some special fairground and circus memories from childhood but an interest in such things was never encouraged but I have made up for that in recent decades! The interest in the fairground led to the production of four books and provided subjects that I still love to deliver talks about. The present interest in the circus world grew out of an interest in the fairgrounds - but they are two separate and distinctive worlds. In all my interests a “teacher” or “guide” always emerged to help me and inspire me. 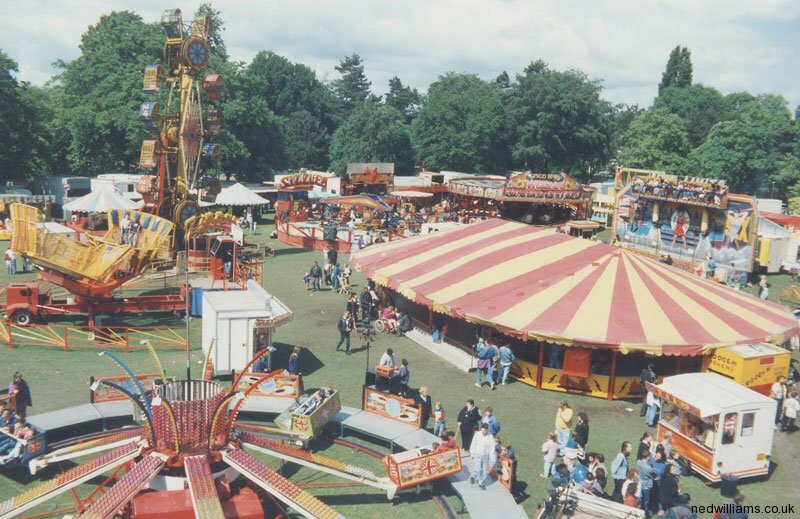 In the fairground world I owe a great debt of gratitude to the late George Dobson - you can read his story in “Midland Fairground Families”, published in 1996. The thread that has held all my work together has been my love affair with the Black Country. It started on the day I arrived in the Autumn of 1962 and was nurtured by the creation of the Black Country Society in 1967. When I joined the General Studies Department at Wulfrun College in September 1967 it was more or less compulsory that one joined the Black Country Society - which had been launched by a member of staff who had just left: Dr. John Fletcher. It is difficult now, in the 21st Century, to imagine how exciting all this was. We approached our interest in the Black Country with missionary zeal - it all gave a new impetus to exploration, research, recording dialect and memories, putting on shows, taking photographs, and making films. At the time I felt a “furriner” like myself would hardly be eligible to serve on the committee, but later joined during the period of Keith Hodgkin’s chairmanship. It was a great honour to recently serve for one year as the Society’s President. In the early 1980s I purchased a book called “A Nation of Shopkeepers” containing wonderful photos of surviving shops that featured all kinds of fascinating aspects of shops and shopping as experienced in the past. The authors had travelled the length and breadth of Britain to assemble their collection of photos. I decided to start a project aimed at looking at shops in the Black Country. This resulted in the publication of “Shop in the Black Country” (1985) and an interest in such matters that has continued to this day. The interest also contributed to my interest in the Co-op Movement - resulting in two more books and another interesting avenue of research. Of course, the Co-op is more than just retailing so the subject took me into many other areas - including a return to my interest in banners. It was not possible to become interested in shops without also wishing to photograph them and then to model them. A row of Black Country High Street shops was built in to the international “Dolls House” scale of 1” to the foot. The street eventually incorporated a working model cinema and then outgrew all available space in which to keep it. It was sold to a lady from Liverpool who responded to my advert in Exchange & Mart. (No Ebay in those days!) I then began building models of shops in the scale of ½” to the foot - and built twice as many. It was not possible to look at shops and start modelling them without taking an interest in a host of other buildings ranging from pubs to chapels, via industrial buildings and back to entertainment buildings. This led to further specialised interests I would like to share with others - including a love of corrugated iron buildings. I suppose my idea of heaven is to find a corrugated iron chapel, co-op, or cinema! In one of the photographs you can see me presenting a copy of "Midland Fairground Families" to George and Jean Dobson. In another you can see my 92-year-old Aunty Freda meeting ringmaster Norman Barratt OBE, and on the right I am off to a circus visit to Circus Mondao with the Circus Friends Association. We regularly join trips organised by the Circus Friends Association in this country and abroad. A photo shows daughter Kate with some of the ½” scale models. Some of these buildings found a home on the railway layout based on Francis Ashley’s Gauge 2 Collection (See above) and others were used by my daughters alongside their “Sylvanian Families” collection. There were also lots of people around to nurture an interest in the theatre including my father who took me to see The Crazy Gang at an early age. My father also took an active part in amateur dramatics but somehow my heart was always in films and film-making rather than the theatre. I did study for a drama qualification and became an Associate of the Drama Board, but putting the letters ‘ADB’ after my name didn’t seem to produce any results. In 1972 I made a written and performing contribution to a show called “The Wellesbourne Tree”, based on the life of Joseph Arch and created to celebrate the centenary of his founding of the National Agricultural Workers Union. I later turned it into a film called “Maria Marten and the Red Book”. I still occasionally yearn to work in the world of documentary drama and think back to the good old days when school brought us close Joan Littlewood’s work down the road at Stratford East. At the Theatre Royal in Stratford I came across an an actor named Ewan McColl and later (about 1967 to 1970) I used to sit at his feet when he and Peggy Seeger ran the Union Folk Club somewhere near Farringdon Road. Earlier in life my father and I had been glued to the radio to hear the “Radio Ballads” of Ewan McColl and Charles Parker. I throw all these names in just to show how much I have been “influenced” and inspired by others.